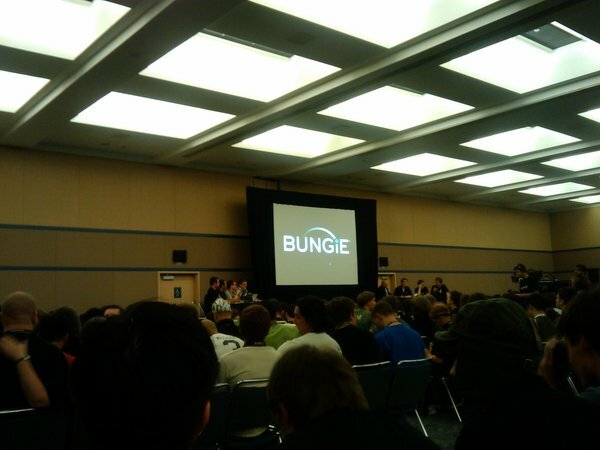 Bungie hosted a panel at PAX called -- what else? -- "Prepare to Drop", featuring some new Halo 3: ODST information and behind-the-scenes media. Bungie writer/author Joseph Staten stole the show, moderating and also providing the bulk of the information presented to an estimated 300 people in attendance. Other notable figures on the panel were composer Marty O'Donnell, Lars Bakken, Curtis Creamer, and community manager Brian Jarrard. All too gladly they produced concept art, hilarious clips of the voice talent cast cutting up, and even samples of the dramatic new musical score for ODST. Almost right off the bat, the team revealed a new enemy for the campaign and Firefight -- the Engineer. So far, we've only seen this Covenant baddie in the latest gameplay video and without any additional info, such as weaknesses or attack styles. Shooting an Engineer in the large cover on its back will trigger an explosion that not only kills the Engineer...but causes splash damage to nearby vehicles or foes. Speaking of vehicles: two new pieces of concept art were shown, both of familiar machines retrofitted as civil services vehicles. The first was a Pelican that was colored gray and white, and the word POLICE painted down the side of it. The UNMC version's chin turret was modified to also accept cameras and spotlights. The second vehicle shown was an Elephant that was converted into a garbage truck, complete with The Superintendent's logo emblazoned on the side. There was no indication that either of these would be playable. Throughout all of this, Staten explained that the inspiration for a the vast majority of ODST's texturing and lighting came not from previous Halo games, but from the film noir genre. At first, that sounded ridiculous, but after some comparison of ODST screenshots to classic noir publicity photos, you could see the resemblance. Marty O'Donnell's music preview -- a completely new, more jazzy direction (saxophones and all) -- confirmed it: this was a game very much inspired by noir. Bungie is seeking to depart ODST from the rest of the series in terms of its artistic presentation; after attending "Prepare to Drop", I'm convinced they can do it. After previewing the music, the panel confirmed an addition to the voice cast: Nolan North, who was previously rumored to be involved with the project, does indeed play the character of "Romeo". You may know Nolan's voice from Uncharted: Drake's Fortune, Halo 3, and our occasional Co-Opticast bumper for In-Game Chat. Following that nice little piece of news was a gag reel from the recording studio, which included Nathan Fillion snorting at Tricia Helfer's forced excitement, and Alan Tudyk claiming to have scratched Nathan's iPhone in an attempt to get him riled up. The whole video looked like a lot of fun, and squared away our confidence that the music and voice acting was going to be a new bar for future Halo titles to reach (see what I did there?). Before taking questions, we were treated to yet another interesting surprise: Fourth Wall Studios, the viral marketing firm responsible for the "I Love Bees" Halo 2 viral campaign, is implementing "Sadie's Story", a mystery within the ODST campaign that can be pieced together as a series of side quests (of a sort). Not much more information on this was given, other than that it could potentially add two hours to the game's 10-hour main campaign. The last official note was an encouragement to pre-order for the Sgt. Johnson Firefight playable character. Staten made it very clear that once the game ships, only the pre-order codes will unlock Sgt. Johnson...no DLC nor in-game accomplishment will bring him into the Firefight battleground. -- The game will ship with 10 Firefight maps. -- ...in addition to 24 Halo 3 versus maps. -- The Battle Rifle was cut purely due to a lack of memory space. -- The worst thing for Bungie to cut was a couple of Skulls that didn't make it into the final game. -- Reaffirmed: no Elites anywhere in ODST. 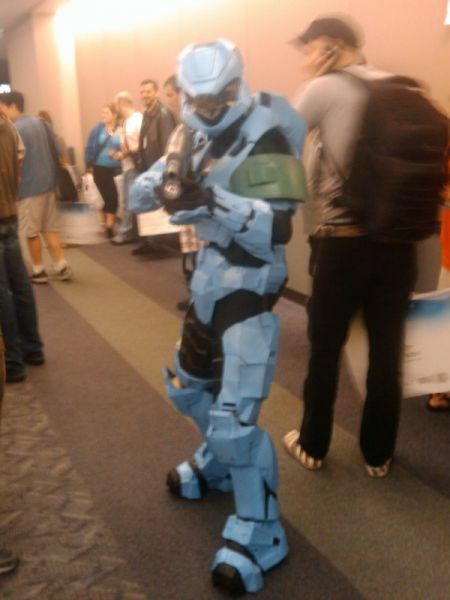 -- Motion capture was never used for any Halo games, no plans to do so in the future. -- DLC may be available in the future, but the team is too busy with Halo: Reach to focus on DLC for ODST. So there's your Halo 3: ODST update, straight from PAX! One last thing before we let you go: just before the ODST panel started, a new live-action trailer was released exclusively by IGN. Check it out below! Page created in 0.2996 seconds.